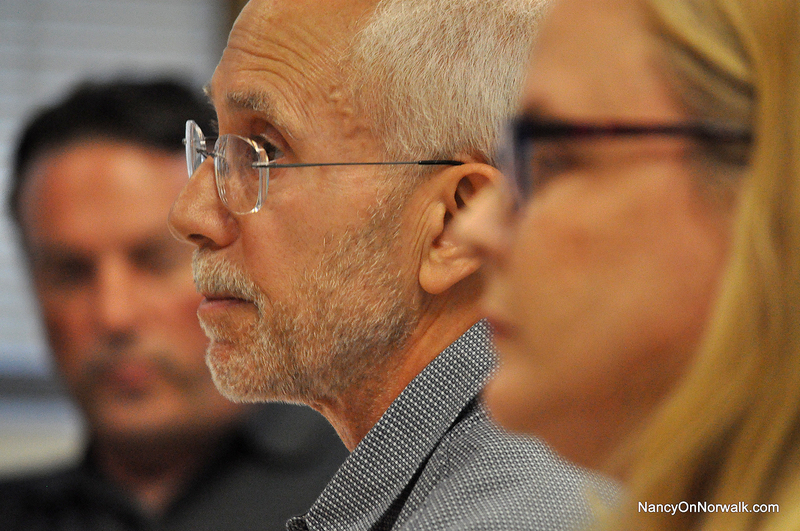 Norwalk Board of Education member Bruce Kimmel, center, speaks Tuesday in City Hall about the 2018-19 Norwalk Public Schools operating budget. At left is BoE member Bryan Meek; at right is BoE member Barbara Meyer-Mitchell. NORWALK, Conn. – The Norwalk Board of Education finalized its 2018-2019 budget at a “peaceful” meeting Tuesday, with some members noting tough challenges ahead and one looking back to remark on the moment’s significance. The 2018-19 Norwalk Public Schools operating budget cuts 22 positions while adding more than 24 fulltime positions in other areas. Total spending of $190,494,217 represents an increase of $6.4 million, or 3.5 percent, compared to the 2017-18 budget of $184,084,348. “I think that it’s worth noting a milestone that we have reached. We are with this budget completing the implementation of our strategic operating plan,” former BoE Chairman Mike Lyons said. With this budget, Board members are lengthening the school day at six elementary schools, increasing the high school graduation requirements to 26 credits, and eliminating most study halls, Lyons said. The Board is also piloting music lessons for fourth and fifth grade students. Barbara Meyer-Mitchell asked for the per-pupil expenditure, speculating that, based on back of the envelope math, it’s $16,288 per pupil. That figure would be Norwalk’s lowest per-pupil spending since 2012-13, according to state data. Norwalk was listed by the Connecticut School Finance Project as spending $16,989 per pupil in 2016-17. Norwalk Superintendent of Schools Steven Adamowski told Meyer-Mitchell that NPS won’t have the per-pupil spending statistic until Oct. 1, but agreed with her that it’s likely that the per-pupil figure going down. “I hope that our city officials can keep that in mind as we go into next year’s budget cycle, that, obviously we look for efficiencies but at a certain point we have to be realistic about our population growth,” Meyer-Mitchell said. The new budget cuts 12 paraprofessional positions, four middle school guidance secretary positions and two Central Office positions, and eliminates the Pathways at Briggs Academy and the Naramake School Resource Center. It consolidates four high school assistant principal secretary positions and keeps two guidance counselor positions vacant and cuts the middle school sports budget in half. A retirement incentive mitigates the paraprofessional cuts at least partially, NPS Chief Financial Officer Thomas Hamilton said last week. The budget also authorizes the hiring of 18 teachers “to eliminate study halls,” in the high school program expansion, and six specials teachers for the six elementary schools that are getting a longer school day. The $250,000 listed as salaries for the music pilot is “intended to add up to 3 full time music teachers to cover the addition of band instruments at the elementary level,” NPS Communications Director Brenda Wilcox Williams said in an email. It includes $225,000 for an unfunded state mandate requiring a full day program for expelled students, with the funds covering employees and programmatic costs, Wilcox Williams wrote. The budget was unanimously approved, with Julie Corbett voting by telephone and Erik Anderson absent. “What we have seen over time is when we have dedicated resources to that operating plan we have picked up efficiencies that in turn minimize these hard decisions that are placed on us by the realities of what the city is willing to fund for education,” Meek said Tuesday. Norwalk Public Schools’ operating budget has increased by $22 million over the last four years, Rilling said in April. That includes a near-$8 million increase in 2017-18 and an increase of more than $5 million in 2016-17. Unlike master plans adopted by the Zoning Commission, the “strategic operating plan is actually being implemented,” he said. Bruce Kimmel just loves to spend our tax dollars. He proved this when he pushed for the out of control overtime at the police department. The taxpayers will was to use flagmen and save millions .Bruce Kimmel’s, will was to line the pockets of the unions. As long as the BOE says it maintains school salaries “competitive” with our neighboring wealthy towns the effect of the BOE Budget on the City will be continued Grand List stagnation, falling property values, ever higher already punitive taxation and continued exodus of long time homeowners replaced by short term renters taking advantage of our school system while avoiding paying their fair share of taxes. So we know our future. Few will retire in Norwalk. And our public Union members will continue to avoid living here citing high taxes. Our administrative salaries are lower than in our neighboring wealthy towns (our superintendent is the lowest paid in lower Fairfield County). We spend $2,000 to $5,000 LESS per student than our neighboring wealthy towns. Yet despite that, the fact is that our property values are RISING, not falling, and are doing better on a percentage basis than some of our wealthy neighbors are doing. According to Zillow.com, Norwalk’s average single family home value hit bottom in February, 2012 at $449,000. Today the average value is $600,000, which is a 34% increase in value in the last 6 years. By contrast, Zillow shows that Westport’s home values are only up 8% over that time, and Wilton’s are only up 2%. Obviously there can’t be a net outmigration of single-family homeowners from Norwalk or those values wouldn’t be going up so much faster than Westport’s and Wilton’s; people are buying! Norwalk’s problem isn’t an overly-expensive school system (we have the least expensive in the area), nor an exodus of single-family homeowners (you don’t get a 34% increase in values in a shrinking market). Our taxes ARE, however, driven by a lack of growth in the commercial tax base, and an overdependence on apartment construction. What we need there is a CITY strategic operating plan like the one that has brought so much success to our school system. Maybe that success in our schools accounts for part of the reason our homes have accelerated in value faster than in surrounding communities? See https://www.nancyonnorwalk.com/2018/02/adamowski-highlights-next-gen-gains-yordon-cites-dedicated-staff. Mike Lyons makes some very good points but clearly the tax system needs an overhaul. I spend part of the year living in Switzerland where property taxes are effectively 20% of Norwalk’s, yet the schooling and amenities are of much higher quality (salary taxes are also lower). Maybe short term renters with children in school should be paying more, but everyone I speak to complains ab out the high taxes, and yet the schools and police are paying investment bank level salaries!! The over, over overpaid glorified utterly useless “police” (lol) at work sites makes me want to vomit every time I see their complete and useless … selves doing nothing but playing on their phones. I actually saw a police women leaning on her car while the electric guy directed traffic on east avenue about 3 months ago!